Last week of The Walking Dead left with Carl in dire straits as Shane and Otis were trapped by the walkers attempting to get the respirator and valuable medicine. Sophia was still missing with Dale, Andrea, Daryl and Carol still at the RV while Glenn and T-dog made their way to the farm to get T-dog some assistance for his lacerated, infected (non-zombie) arm. The episode opens with Shane shaving his head and staring into a mirror, clearly disturbed. We then cut back to the events leading up to this point. Shane and Otis are running from the walker through the halls of the high school. Rick and Lori look over Carl, whose condition is only getting worse. Rick tells stories of Shane’s hooligan past. Reaffirming to himself and Lori that Shane will make it back, he always does. Daryl is disturbed by Carol’s crying, whilst Andrea practices loading his gun. Daryl decides to look for Sophia, Andrea tags along much to the chagrin of Dale. They have a conversation about Daryl’s trouble past and when he was also lost in the woods as a child. Daryl wants to know if Andrea wants to live. She agrees to answer if Daryl will put a walker, a man who hung himself in a tree, out of his misery. She doesn’t commit to wanting to live or die, or just “go on”. Not much of an answer, Daryl agrees with me, but shoots the walker regardless. Andrea is “working on” forgiving Dale she says after he gives her weapon back. Lori is contemplating letting Carl go, as she sees no place for him in this world of endless running and suffering. She challenges Rick to come up with a reason. Back at the high school, Otis plays decoy so that Shane can get out a nearby window with half of the supplies. Shane saves Otis from a crawling walker that gets ahold of him. 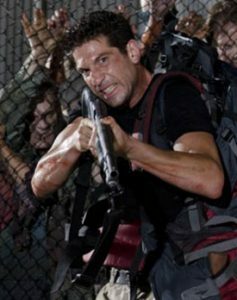 Shortly thereafter Otis returns the favor taking out multiple walkers, with his last rifle bullets, that are about to take down the injured (from the 20 foot fall out of the window) Shane. They are both running low on ammo and moving slowly. It’s clear that Shane is breaking. They finish the procedure on Carl before Rick and Herschel tell Otis’s wife Patricia, while Lori looks in on Carl. Glenn comforts Maggie, Herschel’s daughter who has known Otis since she was a child. She has lost faith and tried to comfort Glenn as he struggled, so he in turn helps her. Lori tells Shane to “stay”, it feels like a temporary relief, but not much. We are now back at the beginning of the episode. Shane has a change of clothes and stands in the bathroom. He takes his shirt off. Is that a bite mark?! A patch of hair is missing. He frantically searches the medicine cabinet? For medicine? To cover-up. And then the real terror unfolds. Not zombies, but the breaking of humanity that really makes the Walking Dead a character study more than a horror story. Though this never happened in the graphic novels, this is the turn that will put Shane back on the track that his character was originally written for. Shane’s wounds are from him fighting off Otis, after he shot him in the leg and left him for the Walkers so that he could get way with medicine. He begins shaving his head to mask the missing patch and he stares hard, into the mirror, frightened, angry and slightly lost and insane all at once. The questions we will be asking ourselves as this unfolds; if they take this where I think they do and should, are What would we have done in that same position? Is Shane truly evil? What is an acceptable sacrifice to keep on living? This is probably the beginning of a dark decent for Shane and in the much longer run for Rick as well… stay tuned it’s gonna get hairy. Watch for more Glenn and Maggie, Andrea and Dale, the fall of Shane and possible secrets revealed about Herschel’s farm. Otis (Pruitt Taylor Vince) we hardly new ye.